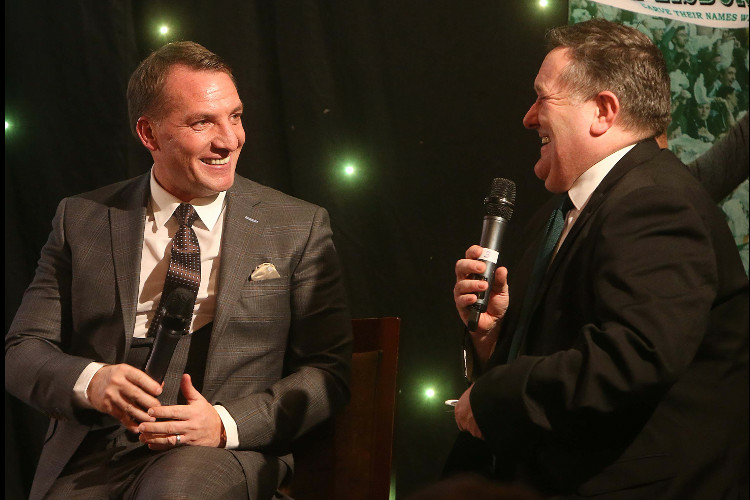 CELTIC FC Foundation’s first official fundraiser in Ireland – One Night in Donegal with Brendan Rodgers – took place on Sunday night at the Silver Tassie Hotel in Letterkenny. It was sponsored by Bulmers, who also very generously provided a complimentary drink for every guest. Almost 600 supporters packed the venue and the sell-out event proved to be a fantastic success, with an incredible amount in excess of £20,000 raised. The event was organised in partnership with the Association of Donegal Celtic Supporters’ Clubs, and they were instrumental in securing key support and in all elements of planning and organisation. With the SPFL trophy, Scottish Cup, League Cup and European Cup all in attendance, MC for the event was Peter Martin and his first task was to invite Donie McIntyre of the Association to provide the warmest of welcomes to beautiful Donegal. Next up was Lisbon Lion legend, John Clark who joined Peter on stage to share some of his most special memories over the many years he has spent at Celtic. Having celebrated his 77th birthday just a couple of weeks ago, on March 13, members of the Donegal Association surprised him with a birthday cake. Peter then invited Celtic FC Foundation Chief Executive, Tony Hamilton to express his gratitude for the magnificent support of those who had played a part in the event and provide an overview of the Foundation’s work. Following a three-course meal, guests learned more about Celtic FC Foundation’s Ability Counts project, the evening’s main beneficiary, through a heart-warming video piece. Operating since 2011, Ability Counts was the first of its kind in Scotland and provides weekly activity sessions for children and young people living with Down’s Syndrome and Autism, plus a group aged 18+ with additional support needs. We are currently working in partnership with Down’s Syndrome Ireland to take the project to the Emerald Isle and delivery will officially kick off this year. The support in Donegal on Sunday night means we can extend and develop this provision and explore ways to make the project available in Donegal and to a greater number of vulnerable youngsters and adults. Next up was the live auction, which included six sensational prizes - signed items from the Manager and Moussa Dembele, a 'play on the park' opportunity through Intelligent Car Leasing, hospitality at Celtic Park courtesy of Bulmers, the chance for a child to be a Celtic mascot, and a stunning Lisbon canvas. And then it was time for the main event. Following a video introduction, Brendan Rodgers took to the stage to a rapturous reception. During a Q&A, the Celtic manager shared a plethora of thoughts and memories with the captivated guests. He strongly emphasised his huge respect for supporters in Donegal and right across Ireland for the monumental efforts and sacrifices they make on weekly basis to follow the Hoops, assuring them that it’s never taken for granted. Brendan reflected on his time at Celtic so far and his hopes for the remainder of the season ahead and beyond. Asked which former Celt he would love to sign for his current squad, he chose the Maestro, Paul McStay. It was a fantastic Q&A session, enjoyed by the manager and every single guest, including members of his family who had travelled to Donegal for the event. He left the stage to yet another standing ovation and then spent a substantial period of time meeting supporters for photos and autographs. Following a raffle, including nine fantastic prizes, the evening was then rounded off with a fantastic live set from Liam McGrandles. It was a wonderful occasion that will live long in the memory and we would like to thank every individual, supporters’ club and organisation who made it happen. Thank you for making a difference.